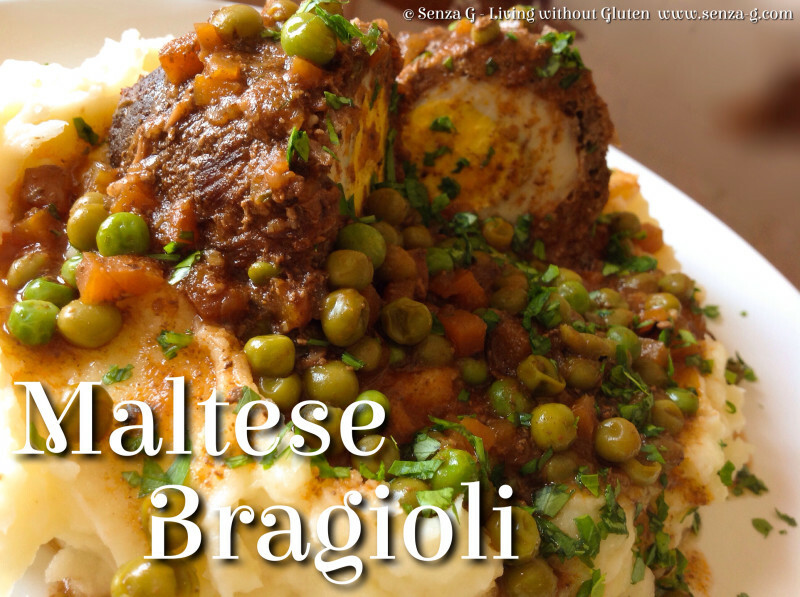 Bragioli is a traditional Maltese recipe and is a version of the Beef Olives recipe. Made very similar to the usual beef olives, however apart from the filling, we also put a hardboiled egg. These are then cooked in a lovely, rich tomato sauce and served with mashed or baked potatoes. Some make a little extra sauce and serve spaghetti as a starter with the same Bragioli sauce. There are many versions of Bragioli, including those with whole slices of bacon and even cheese slices. I have always cooked Bragioli this way, this being my mum’s version. In a bowl, combine the minced meat, the pancetta or bacon, onion, garlic, parsley, Parmesan and the beaten egg. Season with salt and pepper and put aside. Lay out the beef slices on your worktop and place a tablespoon of the mince mix on each slice, spreading it out. Place a whole egg, or half if you prefer towards one end and roll up the beef slice enclosing the meat and the egg. Secure with tooth picks. Do the rest with all the remaining slices. Heat up a little olive oil in a saucepan and cook the bragioli until they brown all over. Remove and set aside. In the same pan, add a little more olive oil and saute the onion, carrot, celery and garlic until softened. Add the red wine and cook for a minute. Pour in the stock, the can of tomatoes, the tomato paste and sugar. Add the mixed spice, curry and bay leaves. Bring to the boil and then lower the heat to a simmer. Put the beef olives or bragioli back into the pan which should be covered with the sauce. Cook on low heat for about an hour to an hour and a half. Towards the end of cooking time, add the frozen peas. Serve with either mashed or baked potatoes and sprinkled with freshly chopped parsley.